Where do you like to take in the majesty of the fall colours? This past week has been spectacular at the Algonquin Log Cabin. The big hills are filled with colour and the water blue as can be. I love the deck at the log cabin. Always peaceful with a soft west breeze. And the sunsets are amazing ! 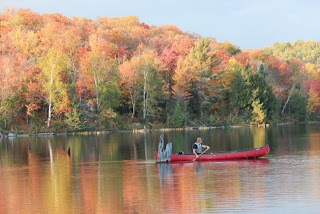 But my favourite way to experience the colour is from a canoe paddling across the blue water. Surprise Lake was calm and so clear with red and orange reflecting off the water. Algonquin Park has spectacular trout fishing and over 1500 km's of canoe trip routes. 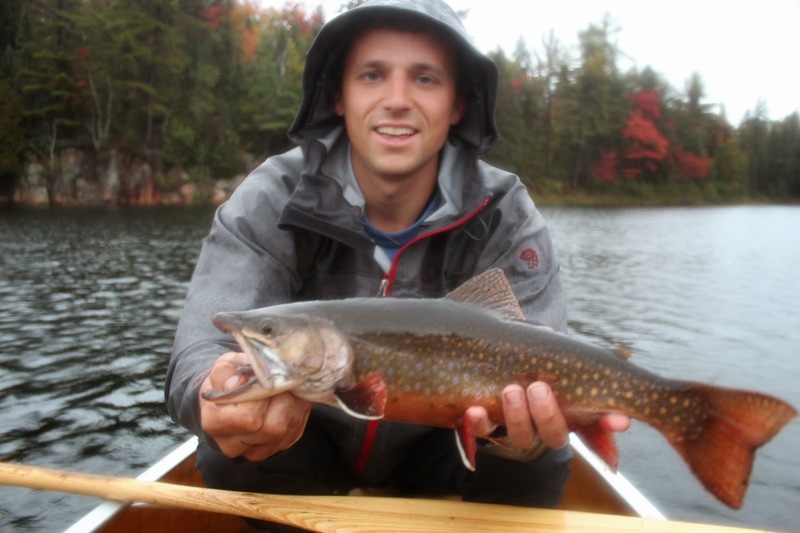 Voyageur Quest runs a series of Algonquin Park Trout Fish canoe trips every year in search of lake and speckled trout. These two night trips feature canoeing into remote lakes to try our luck. 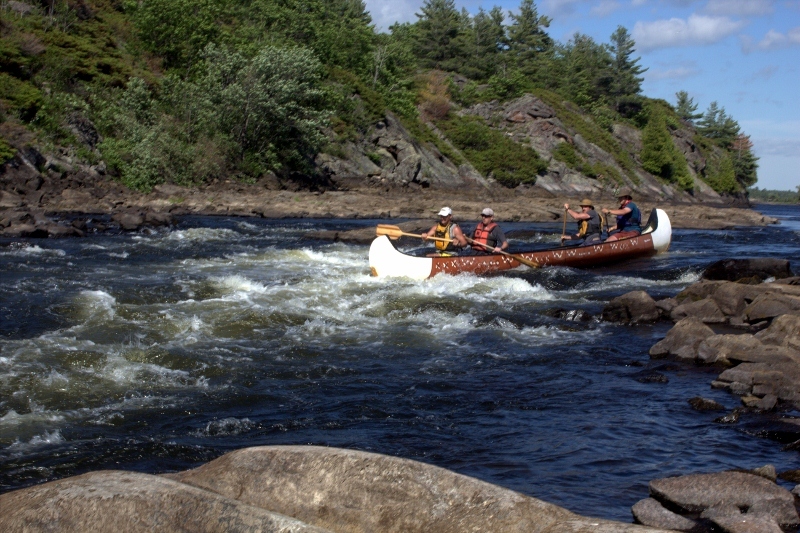 Visit http://www.voyageurquest.com/canoe-trips.php#172 and or call our office for 2014 dates. 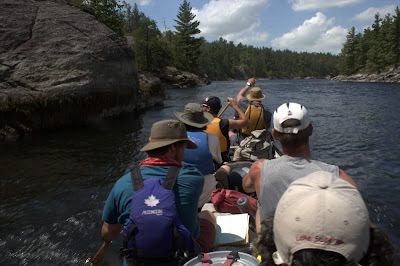 2013 will be Voyageur Quest's 22 year operating Algonquin Park guided adventures. Winter is dear to our hearts ! 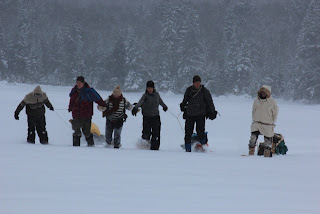 In fact our first guided trips were in winter. Going back to 1991, we operated back country ski trips to Pathfinder Island just north of highway 60.We feel fortunate to be working in such a beautiful landscape where all 4 seasons offer so much to experience. The past few weeks have been stunning at Algonquin's north west corner. Our Log Cabin Christmas was filled with repeat customers from around the world. Stephanie returned all the way from Europe to experience a white Christmas at Algonquin. And white it was. Here are a few shots sent in from Stephanie. 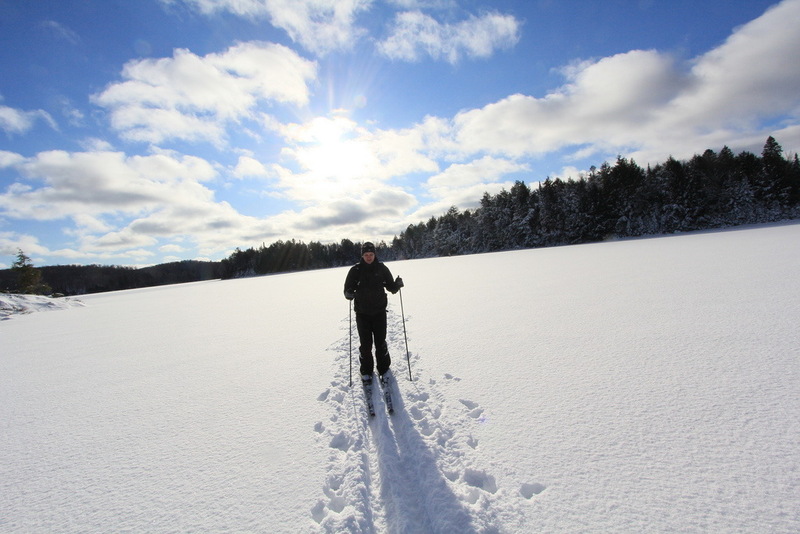 Is there a better way to celebrate Christmas day then a back country ski in the sunshine ! As you can see, conditions are excellent. Here are a few other shots taken from last week. 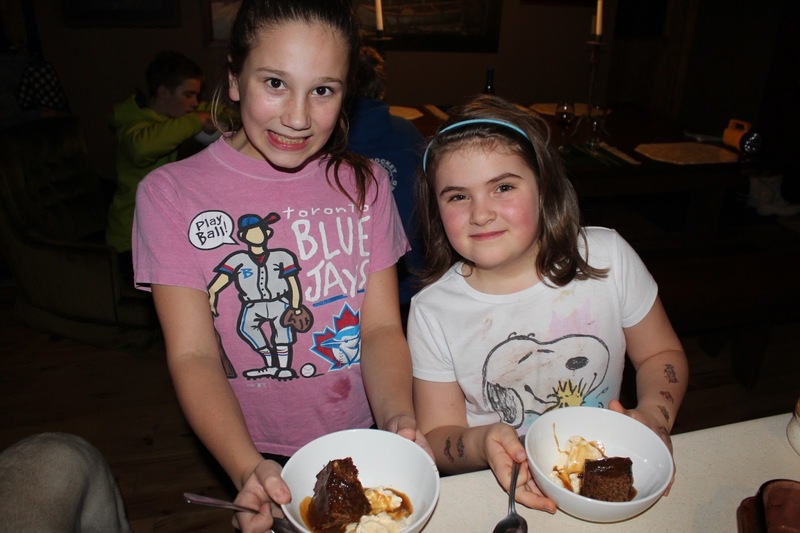 The last is of two happy children with a bowl of Joe's sticky pudding! 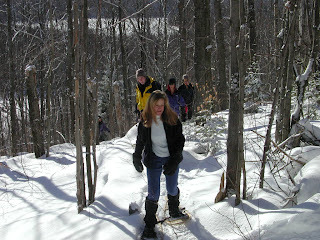 Our Algonquin Cottage Outpost has weekend space in January for any of you ready to work off the Holiday treats ! 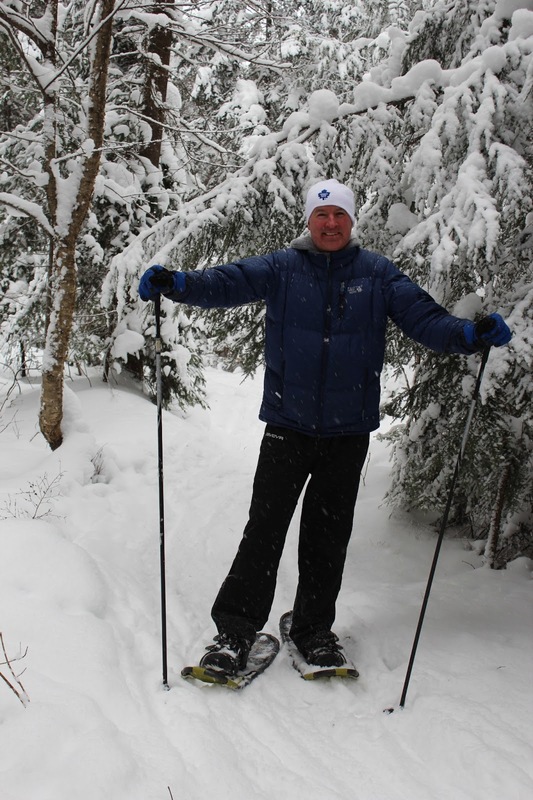 Hope to see you all soon at Algonquin's north west corner for some snowshoeing, back country skiing or dog sledding. With record heat and the sun shining every day, our guided canoe trips into the lakeside paradise of Algonquin Park have been the ultimate escape this summer of 2012. Our guides and guests are living in bathing suits and spending as much time in the lakes as they are canoeing over the water! July is a great month to see wildlife and this year is no different. Our blackboard at the Canoe Outpost reports “Lots of moose, bald eagles, otters, Merlin's, one black bear, white tailed deer, beavers, herons, ducks, northern flickers, and of course the loons. Fishing has been good. 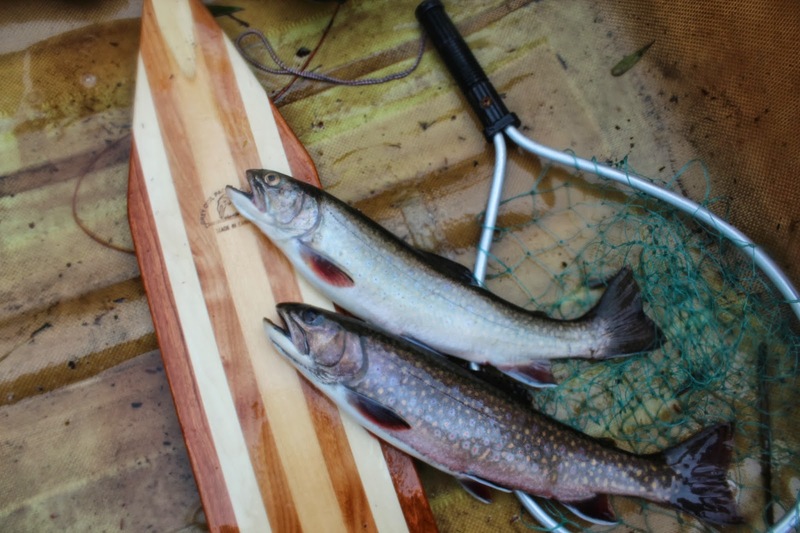 Cody took a personal trip down to the Nippising river and reeled in over a dozen brook trout. The bass fishing has also been great on North Tea and the Amable Du fond river where several 3 – 4 pounds have been caught by customers. One of the highlights of summer is hosting families of all shapes and sizes. 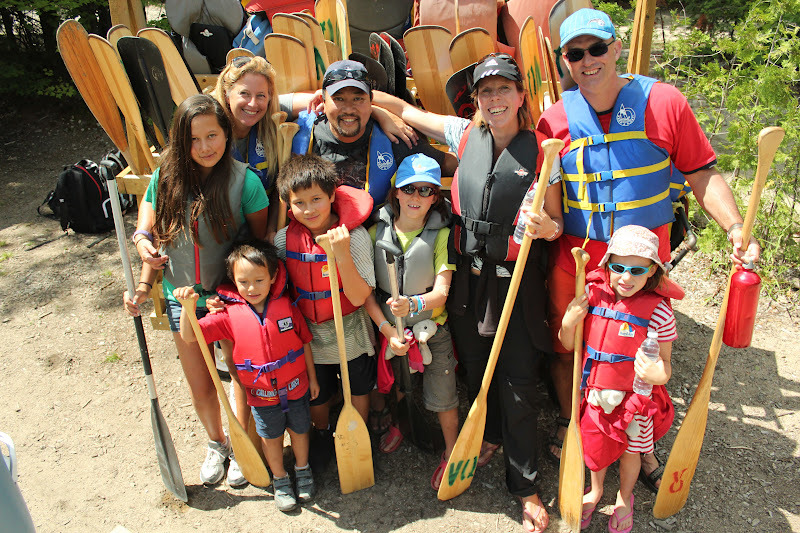 A canoe trip is a wonderful adventure that families can do together. This past July, we hosted families on 3 to 6 day canoe trips from as far away as the UK, Germany, the Netherlands, France, Belgium, Austria, Europe, China, Kenya , Poland the US and of course all across Canada. 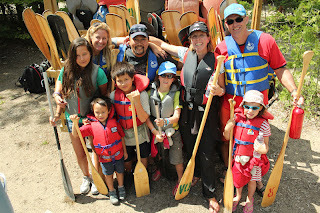 Our award winning 3 day family canoe trip is super convenient to book with scheduled trips going our every Monday and Friday. 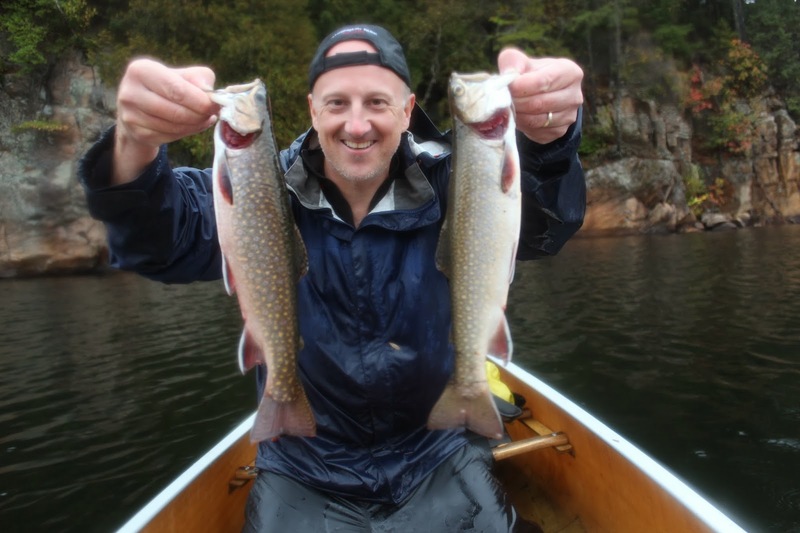 Private trips are a great alternative for families who want to travel deeper into Algonquin, have younger children or perhaps take a river trip to a different area of Ontario. (Picture French river with kids). Cody and Nick were out with families with a Duke of Edinburgh award candidate who were looking for help completing their final expedition. This past Wednesday July 17, helicopters and MNR planes buzzed over us as the province issued a fire ban for all of Algonquin Park. Eastern Algonquin Park had a significant forest fire caused by lightning that ran 5 days until it was put out yesterday. It is amazing that it has been four weeks since we have had any significant rain ! 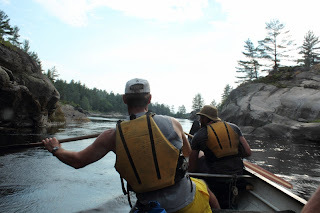 All of us here at Voyageur Quest feel so fortunate to share Algonquin Park with you. We hope to see you “on trip” later this July or August. It is a crazy idea to paddle 80 km in one long day. 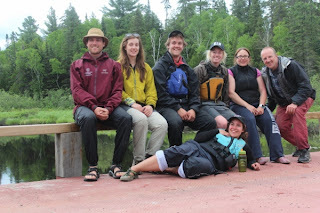 Yet this crazy idea brought the 7 of us together to paddle a massive chunk of the French River - from Wolseley Bay to Georgian Bay - in one marathon day. Something of a 2012 take on the voyageurs and the historic fur trade route on the French River. 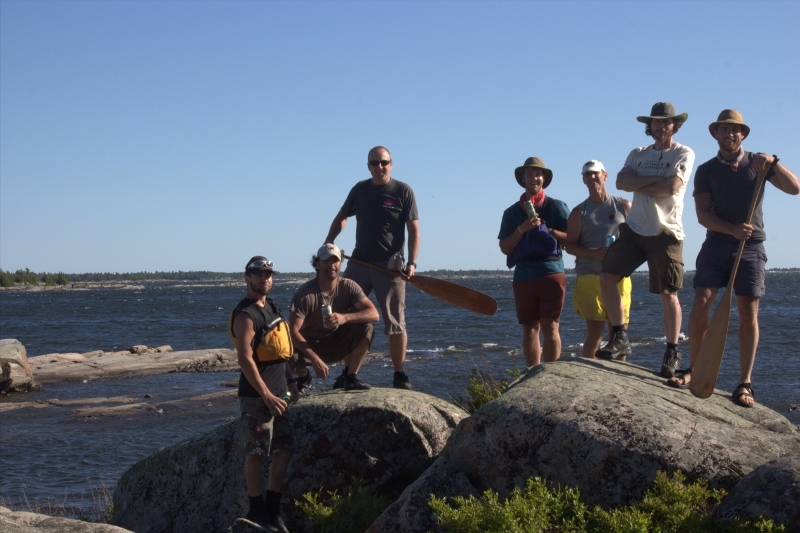 I’ve always known the voyageurs to be a rowdy, somewhat wild crew who paddled hard by day and enjoyed a smoke and sip of something strong at night. Our approach was similar but with the addition of steaks, fresh trout and wine. Late afternoon Monday, we put in and paddled a few hours to get in the groove. One of our seven, Peter, is the definition of a “ringer”. 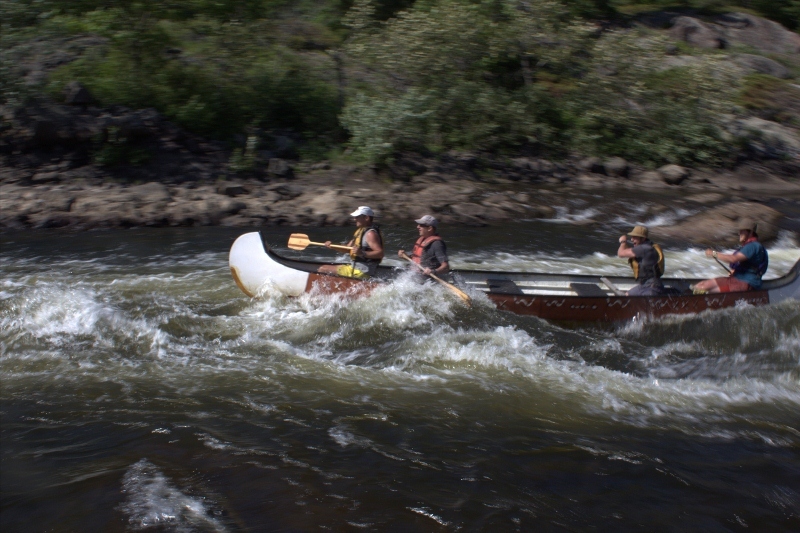 Peter has been paddling Montreal canoes down the French for decades. 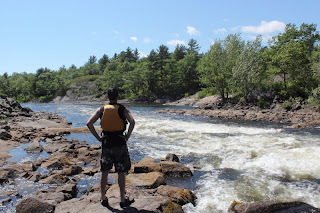 His confidence in what our north canoe could handle was inspiring and in no time we were barreling down the rapids of Blue Chute and Parisien with big smiles. Our 26 foot north canoe looked a little rough with uneven packs, barrel and coolers but we were balanced nicely and with seven paddlers moved at a good pace. At one point our big canoe went over a rock garden and one good sized boulder which stretched the canoe but unbelievably did not break. Amazed ,we paddled on checking for leaks which never came. The French River has amazing camping everywhere and our Monday night site was superb. After a feast of red meat and shiraz, we sipped spiced rum by the fire and talked through our plan for the big day. 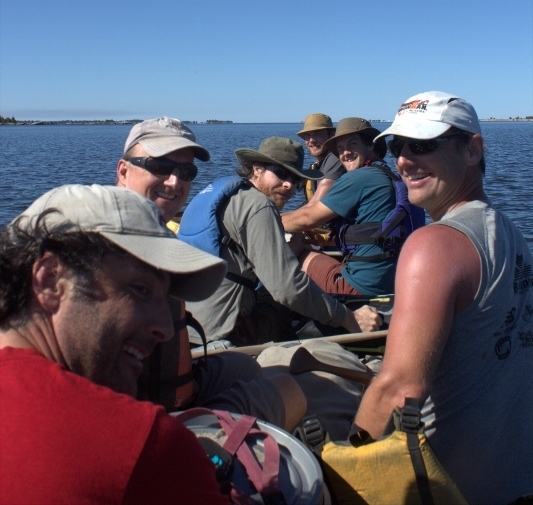 On the water by 5am and with luck – on the bay by end of daylight. Tuesday began with driving rain which thankfully quit as we packed out. With a hit of coffee – we were off. The first 5 hours flew by. 30 odd k and feeling good. 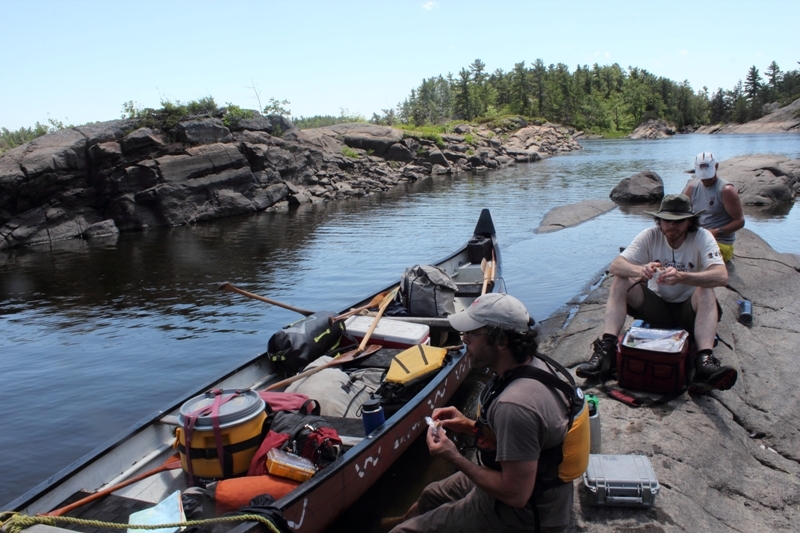 The portage around Recollect Falls was simple and provided a much needed fuel stop. And then the west wind kicked in. The forecast called for westerly winds at 25km and we felt all of it. The canoe slowed but our effort did not. The French River really is a series of lakes and we paddled on through bay after bay. Mid afternoon – we turned south and got a wee break from the brunt of the wind. In no time we were at the Dallas Rapids- a tricky set but one in which we were looking forward to shooting. But our excitement quickly changed to concern . The rapid looked treacherous in one spot . With the early spring melt , the water level on the French was exceeding low and at this rapid translated to the sharp rocks below the surface. Rocks that otherwise we could float over in higher water. So much effort, head wind and now this “fun” rapid was turning out to be our crux. The gate before the bay. We all wanted to run the rapid but with that can opener – the chance of the canoe being torn apart was real. The portage was short but the trails we did see went nowhere and were difficult for carrying a north canoe. Lining was no picnic either. 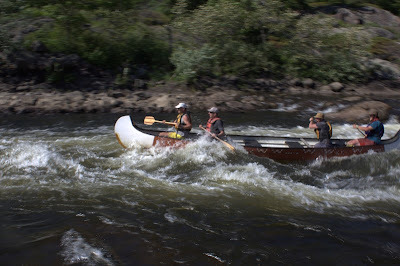 The idea of a difficult portage or line after such a long day on the river was bringing down our energy. There is no reward without risk and with that in our mind a decision was made to shoot “Dallas” without packs and with a lighter weight of just 4 paddlers. Pete gave us the line and we nailed it - with a nice eddy turn to boot! Our spirits soared! On to the bay! Our group of 7 hit the Bay an hour after. The off shore islands protected us from the wind and we were able to paddle out to Sabine Island arriving around 6:15pm. Satisfied and with smiles all around, we hoisted a drink with a gorgeous view of Georgian Bay and the Bustard Islands. Have you ever returned to a favourite campsite and felt like it was like coming home ? For over 20 years I have been leading canoe trips and camping all over Algonquin Park . Some campsites are really special and feel like home to me. I love the solitude, intimacy and quiet of Algonquin Park's backcountry lakes. The campsites are really stunning. 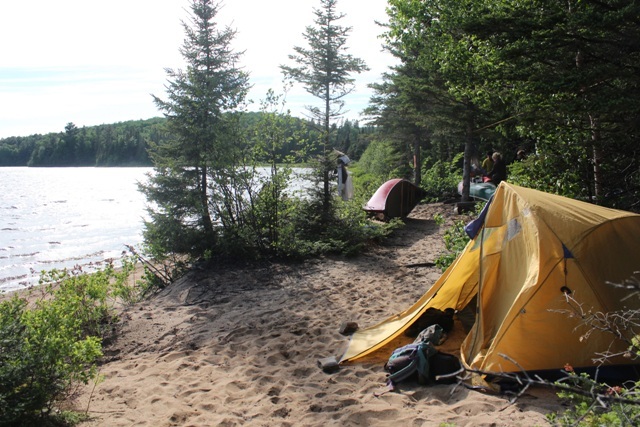 This past week , I was out on a canoe trip back to an old stomping ground and had the opportunity to camp at one of my favourite beach campsites. It had been years since I had been on this route. The wind was howling and we spent a wonderful afternoon swimming, sailing and cooking up a storm. Memories of past trips, of friends who have shared the site with me , the good times we have on the trail- these memories always come back when I am sitting by the fire at a favourite campsite. 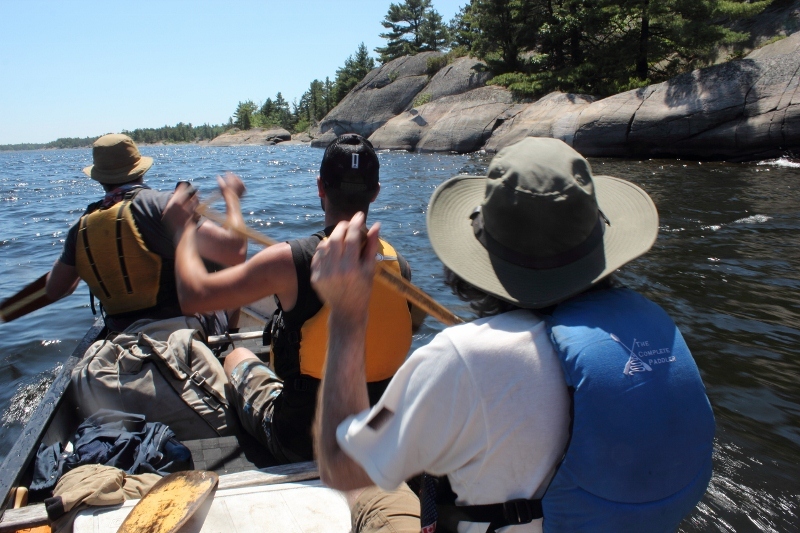 Algonquin Park Canoe Trip Season is open! Spring has us smiling at Algonquin 's north west corner. 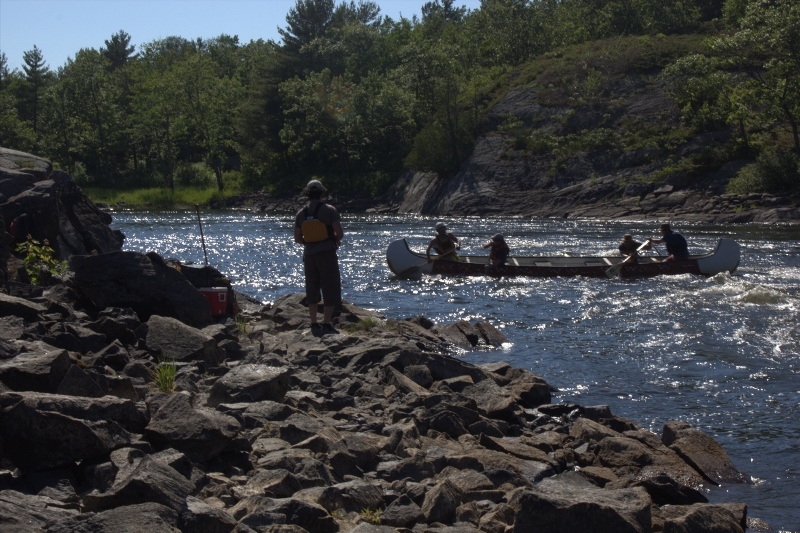 Our guide team have been busy training for our lodge based adventures as well as our guided Algonquin Park Canoe Trip season which starts June 1, 2012. Welcome back Cody and Nick and we are pleased to have Stephanie, Kayla, Dave, Jeremy and Cassandra on board. Melissa will be running the Outpost. Algonquin deep in snow ! Our winter guide team were out at the heated wall tent last week. Snow conditions were fantastic ! 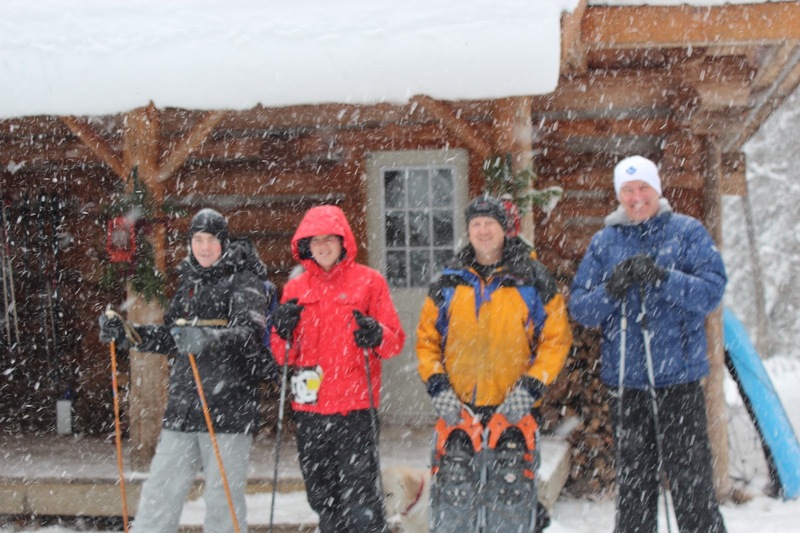 Here is a shot of the team as they arrive back at the Algonquin Log Cabin. With the popularity of Les Stroud aka Survivor man and others, the wilderness is often portrayed as a foreboding place where one can test oneself. This is especially true in winter where many people head into Algonquin Park and other wilderness areas to “survive “ the weekend by building Quinzees (snow shelters) or cold camping in tents. While I applaud the adventure and skills to survive in the winter wild, I would prefer the focus to be on how “comfortable “ nature and life in the wilderness can be. 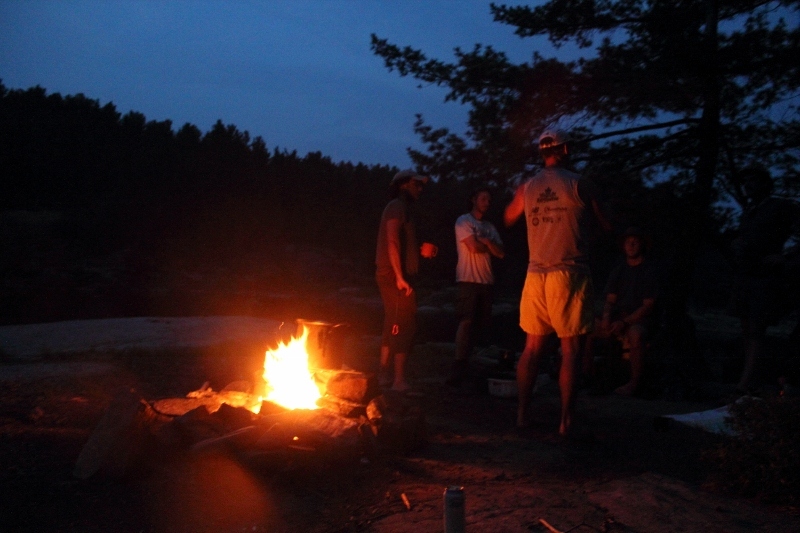 Come to Algonquin or other wilderness to slow down, relax, be at peace, have fun, enjoy. Stripped down to the essentials, living simply need not be harsh or equated to “surviving”. Just the opposite. Many like me and my adventure friends refer to our time in nature as “living the good life “. Many people can understand this “good life” when they are camping in Algonquin Park in the summer. 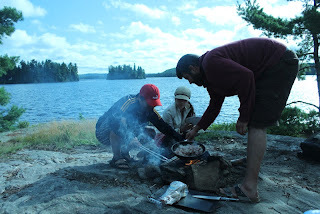 Swimming in clear lakes, fishing, travelling by canoe , sleeping under the stars. All perfect. But what about winter. The image changes and people think danger and survival. 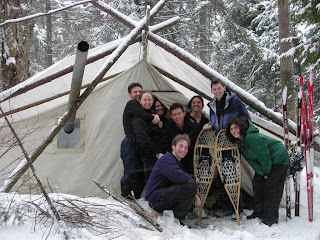 I challenge those of you who think of the wilderness in a survival sense to come visit Voyageur Quest this winter at Algonquin Park’s north west corner. 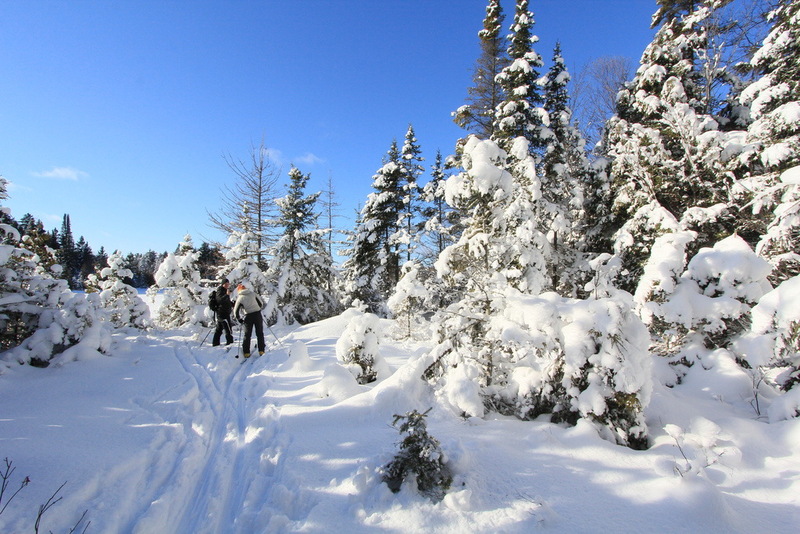 Voyageur Quest operates several Algonquin winter trips including “off the grid” Log Cabin adventures featuring dog sledding, backcountry skiing and snowshoeing. 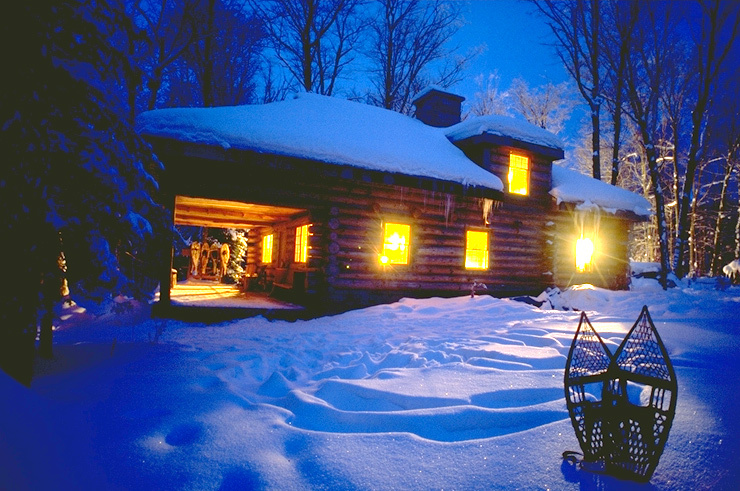 Accommodation and meals take place at in a heated cozy cabin. Finish off the day with a sauna and a drink in front of the fireplace. Our guides teach all skills , provide all equipment and ensure you are having fun. Life is good remember?! 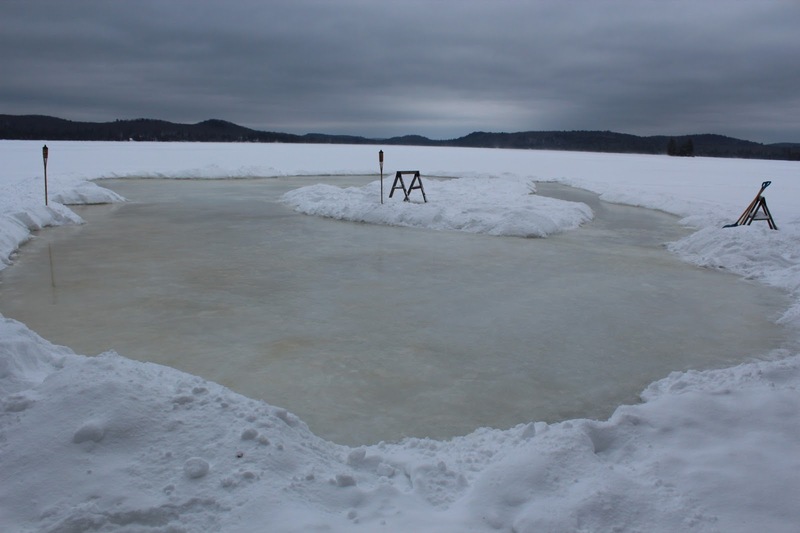 If you want more adventure – snowshoe down Surprise Lake to experience winter camping in a “hot tent”. 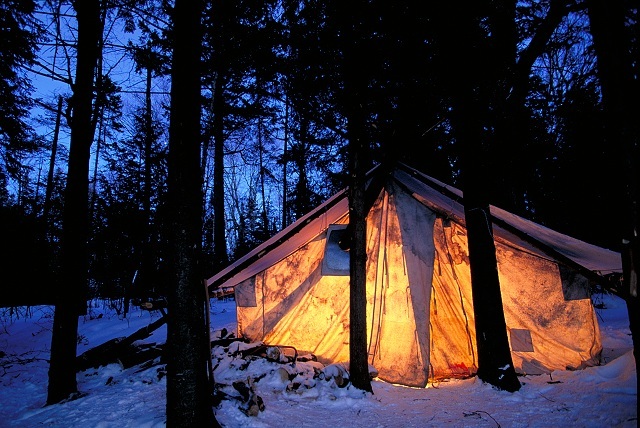 These canvas tents have a wood stove that can heat the inside to the tune of 20 degrees c or 65 Fahrenheit. Sleep on pine boughs that give the air a sweet hint of the forest that surrounds the tent. Enjoy hot drinks , a bowl of chile and fresh baked corn bread in front of the wood stove. Walk outside the tent and look up to a night sky that is filled with more stars than you have ever seen before. 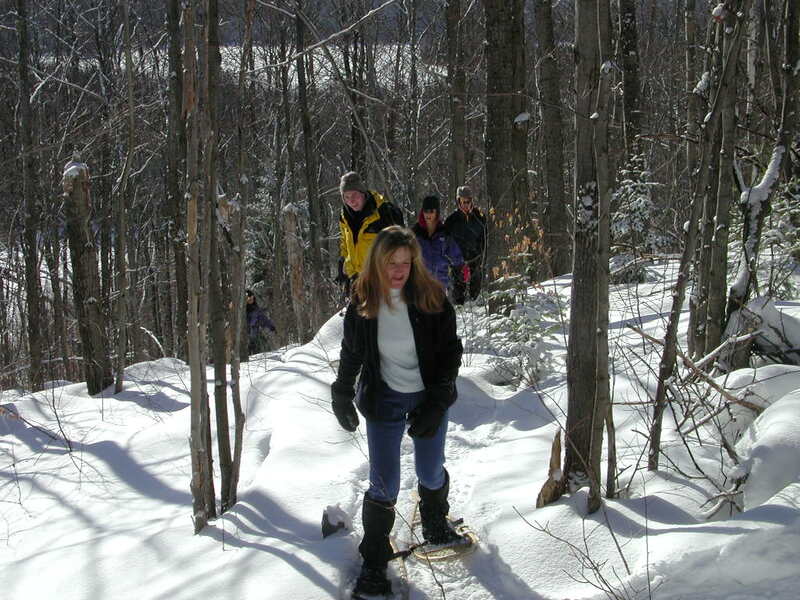 Spend the next day exploring the highland hills by snowshoe. Follow the wolf tracks, moose tracks and otter slides. Feel the warmth of the sun on your face. Breath in the fresh air. Peaceful. Quiet and fun. This is the winter I know and an experience I hope to share with you. If you are looking for a private island or an Algonquin Cabin for a romantic vacation, consider the Algonquin Island Retreat. 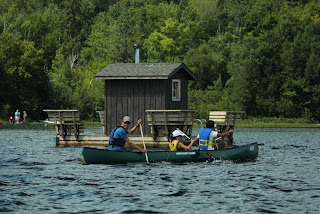 Tiny, "off the grid" and with extraordinary lakeside views in all directions, the island Cabin is very comfortable and has all the amenities you need for the ultimate Algonquin couples only getaway. Solar power translates to running hot water and lights, a wood stove , a stunning second floor walk out bedroom deck, fully stocked kitchen, cosy living and storm room and yes a hot shower! Given the location at Algonquin Park access point # 1, these amenities are really first class! To see more pictures of the Algonquin Island Retreat, click here. 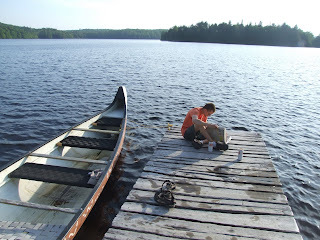 You begin your couples only vacation by arriving at the Algonquin Canoe Outpost where you rendezvous with a Voyageur Quest staff who helps unload your bags and pack your canoe. Don't worry about canoe experience. If you have never been in a canoe or need a few tips , the friendly staff take you through a comprehensive canoe lesson and in no time you are ready for the 15 minute paddle to the island. 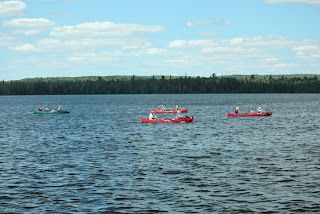 The canoeing on Kawawaymog lake is fantastic. Explore the lake's many islands or paddle down the the Amable du Fond river. Rest tired bones in the floating sauna. The 3 decks and two docks of the private island are wonderful places to read, relax, sip a drink and photograph or paint. From this vantage, the sunsets, sunrises and night skies are unforgettable. 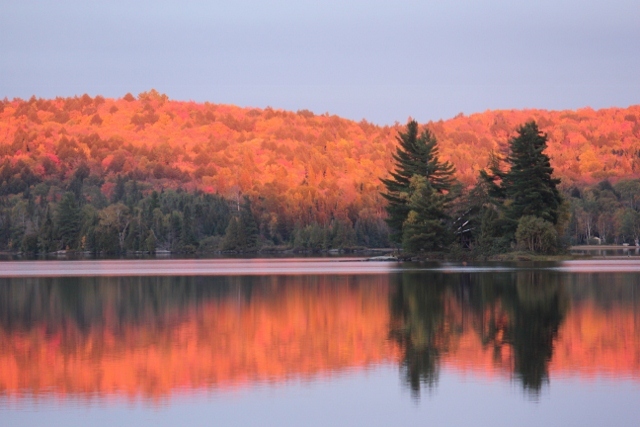 September is the best time to see Algonquin Park Fall colours. 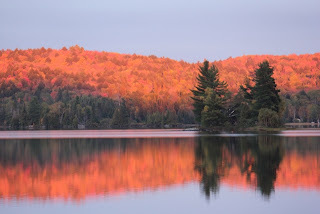 If you like the fall colours, September is the time to come to Algonquin Park. With cool nights and clear days, the Algonquin forests starts to change as early as the last week of August and are filled with colour by September 20. I love to come in the middle of the change - typically between September 15 to 25 where you see a dramatic change every day. The days are summer like and the water still warm enough for a dip. The morning mist is heavy providing living paintings every morning. Peak colour changes every year but the last 10 days of September are always incredible. This year , the colours appear to be peaking September 27 to 30. 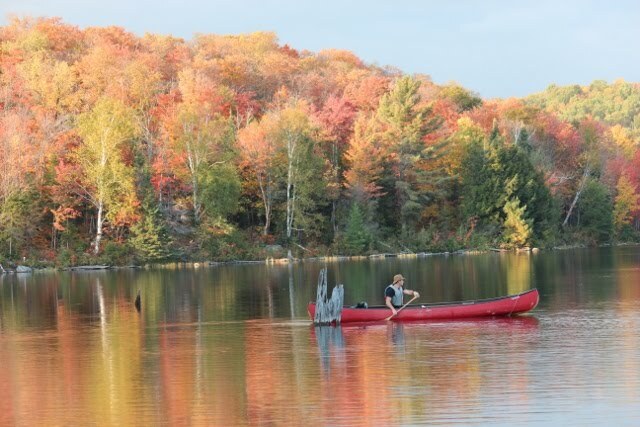 Our three uniquque Algonquin properties offer warm and cozy retreats and ideal bases to catch the colour show. The Algonquin Island Retreat for couples is an extraordinary location to photogrpah or paint as the colours and water surround the cabin. The Algonquin Log Cabin is a good choice for those looking for a fall colour guided adventure filled with fun and interesting excursions and tasty harvest meals. 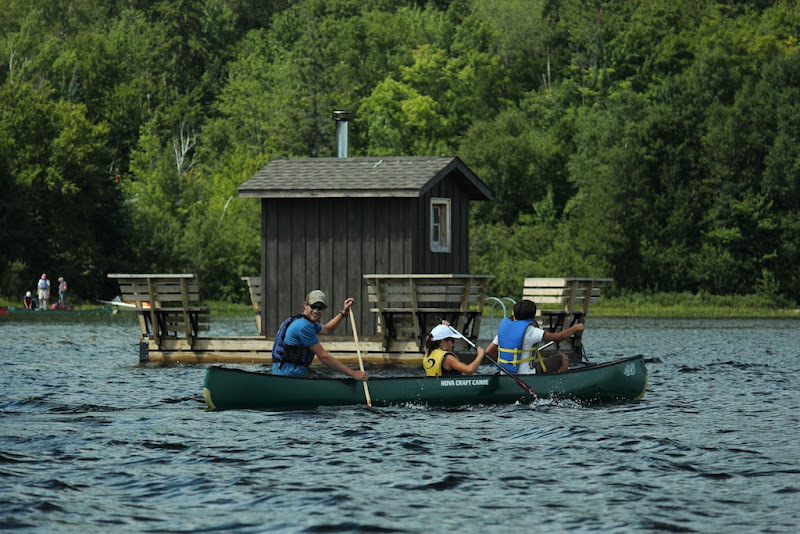 The soloar powered Algonquin Cottage Outpost is another great choice for a private cabin or cottage to base your weekend fall colour adventure. 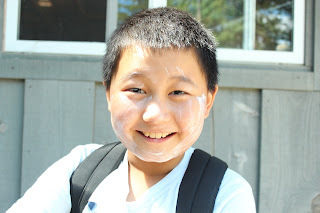 Martin, age 10 , travelled all the way from China with his mom this week to take part in our Algonquin Log Cabin 3 day adventure! I love the late afternoon sun and flashes of silver on the water. This is a shot of Nick paddling over to the Island Retreat. 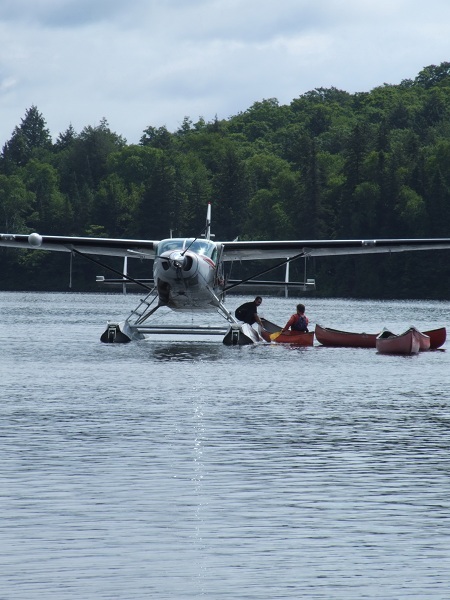 Take a float plane to Algonquin and start your adventure in style! 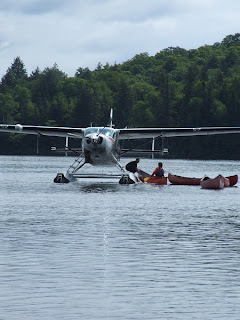 Last week, we had two groups arrive via float planes. From Toronto, the flight time is one hour making it a speedy and exciting way to start your trip. 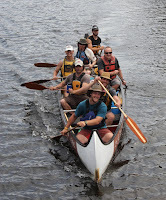 Our Ottawa group timed the flight with the sunrise for a majical start to their Algonquin canoe trip adventure. Bass are biting at the Cottage Outpost ! The bass fishing has been fantastic on Kawawaymog lake this July. Here are a few from last week. John with a 4 - 5 pounder ! Gorgeous weather this morning for breakfast on the bedroom deck. The fish are jumping everywhere! Another beautiful sunrise as seen from the bedroom deck this morning from the Algonquin Island retreat looking east at the Amable du fond river. If you are a fair weather adventure type who loves to experience the great outdoors with sun and heat- come to Algonquin in early July! The past few weeks are a great example of classic early summer weather. Day time temperatures are in mid to high twenties, sunny blue bird days and clean fresh water lake to dive into and cool off. Beyond the warm sunny days, early July is also great for seeing wildlife and the bass fishing is superb! 5:01pm with John, Ben and Ana out for a sail on Round Lake. Roddy towing the Voyageur canoes after a great teambuilding event on the Toronto Islands. Nick wowed our team with his amazing creation! This delicious dish features grilled chicken, asparagus, blue cheese, mozzarella cheese, parmesan cheese, white mushrooms, onions, portabello mushrooms, fresh basil, garlic, and cayenne. No need for dessert after this meal! a newspaper and a cold one at the Log Cabin dock.